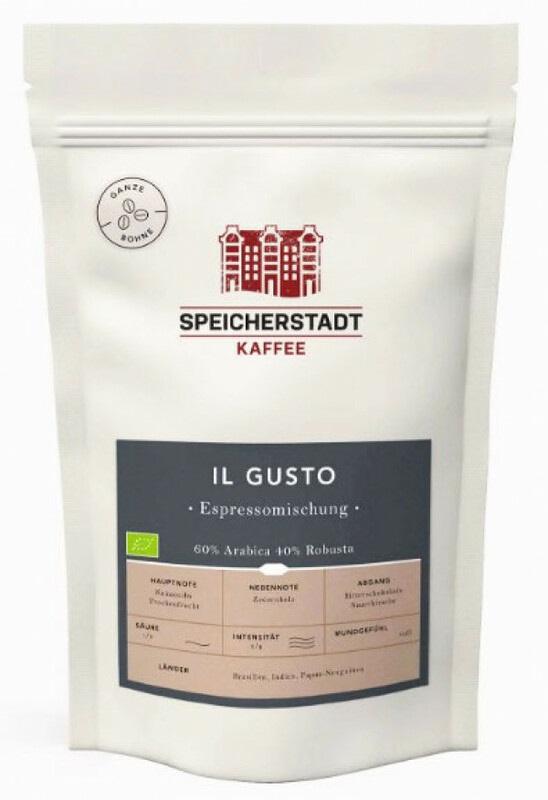 Speicherstadt Coffee IL Gusto from Hamburg | Bio » First class! REALLY DELICIOUS. This spirited top organic espresso Il Gusto captivates with an abundance of aromas with cocoa nibs, dried fruits and a hint of cedar wood and offers a special taste experience. A long-lasting cocoa aroma, which surprises in the finish with a hint of sour cherry and dark chocolate, gives the lovers an unforgettable pleasure experience. The Il Gusto Espresso beans are ideal for the following coffee milk drinks: cappuccino, latte macchiato, flat white, espresso macchiato. Due to the proportion of Robustabohnen, the ideal preparation of the Speicherstadt coffee Il Gusto produces a very fine-pored, airy, hazelnut-brown and very stable crema. The IL Gusto is perfect for preparation in a fully automatic machine, in a strainer, in an espresso maker and for milk drinks. BIO COFFEE - The raw coffee is from 100% organic cultivation (organic). Without genetic engineering and without preservatives.